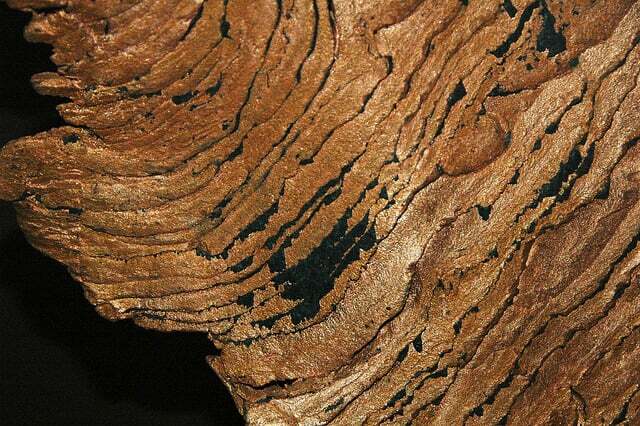 >> Sedimentary Rock: Types and How They Are Formed? Rocks are generally grouped into igneous, metamorphic and sedimentary rocks. Sedimentary rocks are usually well exposed on the earth's surface and in water bodies as well. Rock materials from pre-existing rocks (such as metamorphic, igneous and previously shaped sedimentary rocks) that have been eroded, weathered and compacted over time, make up sedimentary rocks. These types of rocks are therefore, formed from previously existing rocks that are unrelentingly weathered or eroded, then deposited. They are transported to the deposit site by agents of denudation (e.g. water, ice, wind and mass movements). After being deposited, they are compacted and cemented through lithification. Lithification is the process through which sediments are changed into a rock (as you can see, this is how the label 'sedimentary rock' came to be). All types of rocks are relentlessly exposed to erosion and weathering. Small debris from formations of rocks and mountains which undergo erosion together with other granite substances like soils, are usually transported from highlands by denudation agents to low areas. Over long periods of time, the debris ultimately settles through sedimentation. Some materials may settle within water bodies and others on land. Water forces, gravity, wind power, thermal expansion and expansion of salt crystals that dissipate the previously existing rocks into tiny pieces are what usually cause weathering and erosion. As the debris is transported to lower areas, the materials are smoothened by abrasion. They come to a halt by leaving small spaces in-between the grains which causes them to have a distorted shape. They are continuously deposited a layer after another to create a new collection of homogeneous material. After this, carbonates, oxides and silica, which cause cementation and compaction, mix together with the deposits. Compaction caused by the mass of the piling layers of deposits lessens the porousness of the rocks created and increases the cohesion of the grains. Sometimes, fossil fuels together with organic matter may combine with the sediments which lead to cementation. Cementation may be described as the combining of rock materials together by salt crystals or by organic matter. After the mixture hardens, it becomes a rock. 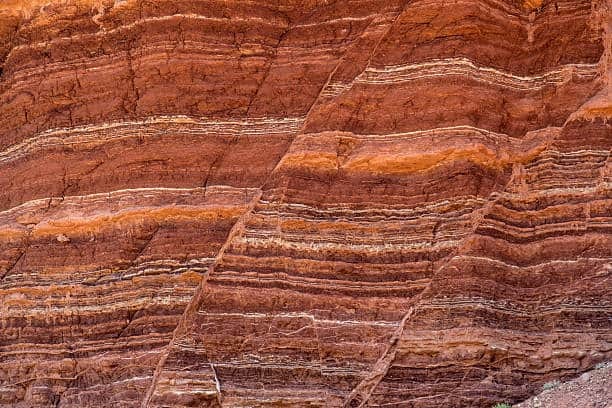 Sedimentary rocks are therefore, made from the deposit of sediments which are weathered, eroded, deposited and eventually compacted and cemented. There are three major types of sedimentary rocks; chemical, clastic and organic sedimentary rocks. Chemical sedimentary rocks occur when components of water evaporate and previously dissolved minerals are left behind. These types of sedimentary rocks usually occur in arid areas; like gypsum and salt deposits. Examples of chemical sedimentary rocks are: chert, dolomites, flint, rock salt, iron ore and some types of limestone. Organic sedimentary rocks occur as a result of the accumulation of any form of animal or plant remains like bones. Animal and plant debris contain calcium that piles up on the floor of water bodies over years to create organic sedimentary rocks. Examples of this kind of rocks are coal, some types of dolomites and some forms of limestone. This is an organic sedimentary rock that is plastic in nature. It is light in weight compared to most of the usual stones. Amber is tree sap that has hardened over time. It is usually clear yellow, creamy yellow, red or dark brown in color. This is a type of clastic sedimentary rock formed from angular fragmented rocks that have undergone cementation. The angular shape suggests that the fragmented pieces have not travelled too far from their previously existing rocks. The fragmented parts look like conglomerate due to their big pea-sizes. Breccias are normally seen along fault areas and take on different colors. Chert belongs to the group of chemical sedimentary rocks formed from deposits of cryptocrystalline quartz. Cherts are usually gray or dull brown and are normally seen as nodules well-enclosed in limestone. They normally protrude out of the mineral when the mineral is put in water. Reddish-brown, red or bright yellowish-brown chert is called Jasper, while chert that has a waxy luster is known as Flint. Conglomerates belong to the group of clastic sedimentary rocks. They result fromthe cementation of semi-rounded pieces of broken rock. The semi-rounded pieces show that they have gone through abrasion and travelled quite far from their previously existing rocks. Conglomerates are usually deposited at shorelines or streams and may be in pea-sizes or bigger. They are at times called pudding stone and are used in the construction industry. Coal is a type of organic sedimentary rock formed from the accumulation of plant material that has undergone decomposition in a swampy area. It is naturally combustible and is usually mined for use as a fuel. It may be brown or black in color and its concentration is dependent on the effect of compaction and changes in the previously existing organic life forms. Anthracite, bituminous, lignite and peat are all examples of coal. Dolomites belong to the group of chemical sedimentary rocks that are similar to calcite. The resemblance is because, dolomite usually starts to take form as limestone but is eventually changed chemically via the substitution of magnesium in place of some of its calcium. Gypsum is a type of chemical sedimentary rock that is soft and can be distorted easily. It is normally white in color and is utilized in the production of plaster of Paris. Limestone belongs to the group of chemical sedimentary rocks formed from mineral calcite. It is usually challenging to visually identify limestone. Limestone may appear in dark gray, light gray or brown color. Examples of limestone are: coquina limestone made up of fragmented shells, fossiliferous limestone composed of fossils, encrinal limestone formed of crinoid pieces, lithographic limestone that has fine grains, and travertine limestone usually transported by water. Limestone is a sedimentary rock that has many uses. It is used in making cement, manufacturing lime, making paper, glass, insecticides, fiberglass, coating chewing gum and making petrochemicals. It belongs to the group of chemical sedimentary rocks usually formed by mineral sodium chloride. Rock salt is normally colorless or white and may have color when combined with impurities like clay or iron oxide. Its salty taste and solubility in water is used to identify it. Rock salt is also referred to as halite. Sandstones are a type of clastic sedimentary rocks formed from sand grains that have undergone cementation. They take on black, brown, gray, pink, red or white color. Sandstones may have either fine or coarse grains which makes them easy to distinguish visually. Quartz (mature) sandstones are light in color and are mainly made of round and well-formed quartz grains. On the other hand, greywackes (immature) sandstones are made of angular-shaped grains of different minerals. Shale is a type of clastic sedimentary rock. It is made up of clay minerals that have undergone compaction by the mass of the overlying rocks. Shales usually have the tendency to break into flat pieces. They are of different colors such as black, brown, gray and red, which depend on the composition of oxides of iron and organic matter. In general they are a wonderful source of fossils and are mainly seen at the floor of lakes or oceans. They are at times added to bricks and cement. Siltstones are a kind of clastic sedimentary rocks. They are made up of small rock pieces which are coarser than clay but finer than the grains of sand in terms of texture. Siltstone is challenging to identify because it resembles sandstone that has fine grains or a coarse type of shale. They come in a wide range of colors. Hopefully, this answers your search on how sedimentary rocks are formed and what are their types in nature. Kudos! this site is amazingly easy for my complicated brain to understand!